A spokesperson for the land office said the most important part of the plan, which was once branded as “reimagining” the Alamo, is preserving the historic mission. “All that 'reimagine' was actually talking about is that someday you will actually be able to see all of [the battlefield] and connect with 1836 better than you currently can,” said Bryan Preston, director of communications for the GLO. Since Bush took office, he has also restructured how his agency manages day-to-day operations of the Alamo through a system of nonprofit organizations that contract with the state. His primary challengers say this management system is not transparent and hides how state money is being spent. Last month, several news organizations obtained a copy of an internal draft audit that criticized how the land office used these nonprofits to manage the Alamo. Bush claimed the audit was “doctored” and said it’s the subject of an investigation. He defended the system, saying that every monument uses nonprofit organizations to help with fundraising efforts. That was just one of several controversies that battered Bush’s campaign last month. The Tribune reported that Bush’s West Austin mansion was financed by a major Republican donor’s bank. The 4,000-square-foot home was legally put under the name of a family trust and wasn't disclosed in Bush’s personal financial statements. Bush said the obligations to report financial real estate interests do not apply to the kind of trust the house is kept under. He also said it was necessary to conceal his home address because he has received death threats. The Tribune also reported that the land office contracted with Horne LLP, an Austin-based accounting firm that specializes in providing disaster recovery services to governments, in October after Hurricane Harvey; three days later, Bush received a $27,500 donation from Horne executives. President Donald Trump endorsed Bush through Twitter last week. “Texas LC George P. Bush backed me when it wasn’t the politically correct thing to do, and I back him now,” Trump tweeted. Bush will face energy and natural resources attorney Miguel Suazo, who won Tuesday's Democratic primary with nearly 70 percent of the vote. 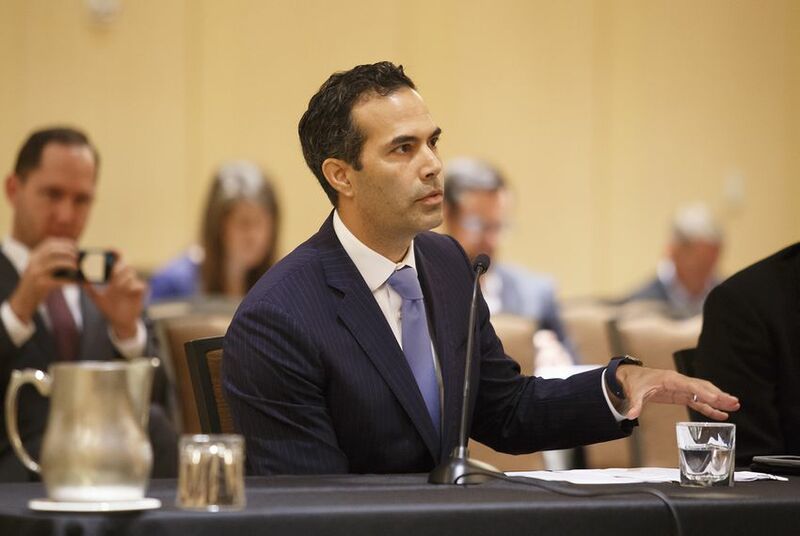 "I'm the Democrat running to beat George P. Bush because it's time for leaders who are qualified to do the job — and it's time to end political dynasties in Texas," Suazo said in a written statement. Disclosure: Jerry Patterson and the General Land Office have been financial supporters of The Texas Tribune, a nonprofit, nonpartisan news organization that is funded in part by donations from members, foundations and corporate sponsors. Financial supporters play no role in the Tribune's journalism. Find a complete list of them here.